Israel Baker was an American violinist and teacher born (in Chicago) on February 11, 1919. He is best known for having played second fiddle to Jascha Heifetz in several chamber music concert series and recordings begun in 1961. He is also known for having led innumerable Hollywood movie soundtrack recording sessions as had Toscha Seidel and Louis Kaufmann before him. In fact, he was concertmaster of the orchestra that recorded the soundtrack for Alfred Hitchcock’s most famous movie, Psycho, in 1960. His sight reading abilities became legendary. Although a classical violin soloist and recitalist, Baker spent most of his career as concertmaster of various studio or concert orchestras, just as has David Nadien, who was concertmaster of the New York Philharmonic for four years. There is scant information on Baker (on the internet) prior to his turning 20. However, it is common knowledge that he played in public (in Chicago) at age 6. The performance is said to have been broadcast nationwide on the radio. It is also known that his first job as concertmaster was with the Dayton (Ohio) Philharmonic. A year later, Leopold Stokowski recruited Baker for his All American Youth Orchestra. At age 22, while still a student at Juilliard, Baker became its concertmaster. (At this point, I contacted Hilary Baker.) That was the summer of 1941. Baker studied first with Adolf Pick in Chicago. Later, he took lessons from Jacques Gordon (concertmaster of the Chicago Symphony), Louis Persinger (teacher of Yehudi Menuhin), and Bronislaw Huberman. Two sources state that he later joined the NBC Symphony in New York (under ill-tempered and rude conductor Arturo Toscanini) but I could not find his name on any lists of NBC Symphony musicians - they somehow missed him. After a lengthy tour with Stokowski, Baker did join the first violin section of the NBC Symphony. He also recorded Scheherazade with the legendary maestro (Stokowski) - much later, he would record the solos a second time. During this time with Toscanini, Baker also had a nationally broadcast weekly radio program on NBC. During World War Two, he was a violinist in the Army Air Force playing for wounded veterans in the U.S. (Atlantic City, New Jersey.) Afterward, he worked for Phil Kahgan in New York for a few years. Kahgan was a contractor for free-lance musicians. Through Kaghan’s connections, Baker ended up in Los Angeles and quickly established himself firmly in the recording world. On August 24, 1947, he made his debut playing the Tchaikovsky concerto with the Los Angeles Philhamonic, William Steinberg conducting. In 1950, in Los Angeles, he formed a duo with Yaltah Menuhin, violinist Yehudi Menuhin’s younger sister. In 1951, they gave a joint debut recital in New York. I don’t know where the debut took place – both artists were in their very early thirties. Although I’m sure one exists, I could not find a review of that recital on the internet. However, after their debut in San Francisco in 1950, Alfred Frankenstein - music critic for the San Francisco Chronicle - called their recital a "brilliant achievement." With pianist Alice Shapiro and cellist Edgar Lustgarten, he formed the Pacific Arts Trio. 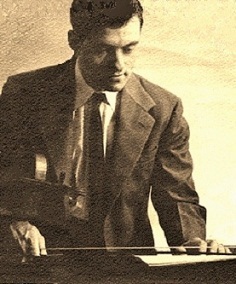 Baker also led orchestras on the West Coast – in addition to the Paramount Pictures studio orchestra - which recorded with many popular artists, including Frank Sinatra, Johnny Mathis, Harry Belafonte, Benny Carter, Sammy Davis, Bill Haley, Dean Martin, Tony Bennett, Mel Torme, Chet Atkins, Bobby Darin, Neil Diamond, Count Basie, Nancy Wilson, Ella Fitzgerald, Judy Garland, Barbra Streisand, and Sarah Vaughn. CBS recordings done with Bruno Walter with the Columbia Symphony included Israel Baker as concertmaster. Being in the studio naturally meant that he also worked closely with film composers, among whom were Andre Previn, John Williams, Bernard Hermann, Lalo Schifrin, Franz Waxman, and John Barry. As a soloist or chamber music player his discography is not extensive but as an orchestral player his sound (even if not individual, except for his recording of Scheherazade with Erich Leinsdorf) is on hundreds of recordings and movie soundtracks. In any case, his recordings of music by Viotti, W.A. Mozart, Felix Mendelssohn, Franz Schubert, Johannes Brahms, Igor Stravinsky, Arnold Schoenberg, Antonin Dvorak, Cesar Franck, Rimsky-Korsakov, George Antheil, Vernon Duke, Eric Zeisl, and Alban Berg are easy to find. Heifetz was quoted as saying that Baker was "a fine fiddler" (a typical Heifetz understatement) and that he was easy to work with. Except for Erick Friedman, Heifetz never recorded with any other violinist. Igor Stravinsky himself picked Baker to record his violin concerto; however, he was overruled by executives at CBS who insisted on Isaac Stern as soloist. In 1981, Baker was concertmaster of the (Orange County, California) Pacific Symphony. He was also briefly concertmaster of the Los Angeles Symphony – not to be confused with the Los Angeles Philharmonic – as well as the Los Angeles Chamber Orchestra. In fact, the Los Angeles Chamber Orchestra was made up almost entirely of highly accomplished studio musicians. Baker taught at Scripps College (a private school in Claremont, California, near Los Angeles) for a time and his best known pupil was Jack Benny. Baker played the Garcin Stradivarius (1731) as well as other violins. The Garcin Strad is now in the hands of violinist Kees Hulsmann. Israel Baker died in Los Angeles on December 25, 2011, at age 92. Toscha Seidel had a famous pupil, too - Albert Einstein. Hilary Baker, one of Israel Baker's daughters, is a well-known painter.